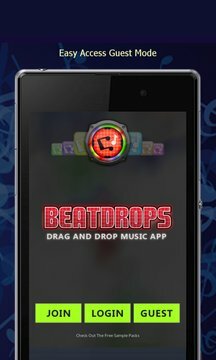 Beatdrops is a fun music and beat creation app for hobbyists and music lovers worldwide. Browse through the included samples or hundreds of downloadable ones or even import your own! Drag and Drop these onto the sequencer and press Play! Other users can download, edit and rate your project. You can also share the app and project via multiple social widgets . Browse other users projects and filter by genre, keyword and bpm. Unlock features like Edit Menu, Save and Sharing of projects. Buy upto 996 more pages. 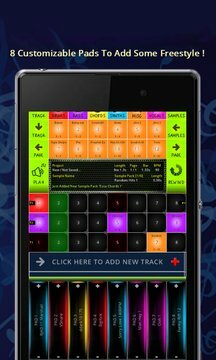 Purchase new sample packs to create more amazing beats. Each sample pack has 12 different ogg sounds. You can preview each sample before downloading. Pack prices range from Free, Sale / Low, Normal and Premium. We also have several Combo Offers at discounted prices be sure to check these out first for example GodMode combo when bought unlocks everything and allows you to download any sample-pack free for life! If you have made purchases via the store and then install the app to another device you can easily update your account from the server to restore your items you have bought / unlocked.